AOMEI Backupper Standard is the best Acronis data migration software free alternative that clone OS or hard disk drives to SSD to protect your data and system. Since its foundation in 2003, Acronis focuses on backup and disaster recovery software based on disk imaging technology. As a provider of disk cloning and imaging solution, the company continues going from strength to strength over these years. The leading data migration software Acronis True Image uses full-system image backup technology to provide data protection for Microsoft Windows and Mac OSX operating system. There is no doubt that Acronis True Image has made a big achievement of data migration, backup and restore in the market. However, Acronis True Image is mainly designed for enterprises with big data to protect. And the newly released Acronis True Image 2017 is subscription-based software plus service and it means that you need to buy the service again and again. If you are looking for a free data migration and disk cloning tool for Windows, here AOMEI Backupper Standard is the best Acronis True Image alternative. AOMEI Backupper is complete and secure disk cloning and system imaging solution for Microsoft Windows users. The backup program is the major software produced by AOMEI company, which has downloaded and recommended by thousands of million users. AOMEI Backupper Standard is the free version of AOMEI Backupper, which allows you to migrate partitions and disk data, upgrade hard drive with faster SSD easily. As the most simplistic user interface and easiest free pc backup software, AOMEI Backupper Standard is, of course, the best free Acronis Data Migration alternative. Here we take migrating hard disk data to another disk as an example, say migrating data in Disk0 to Disk2. Firstly, download the freeware, install and launch it. 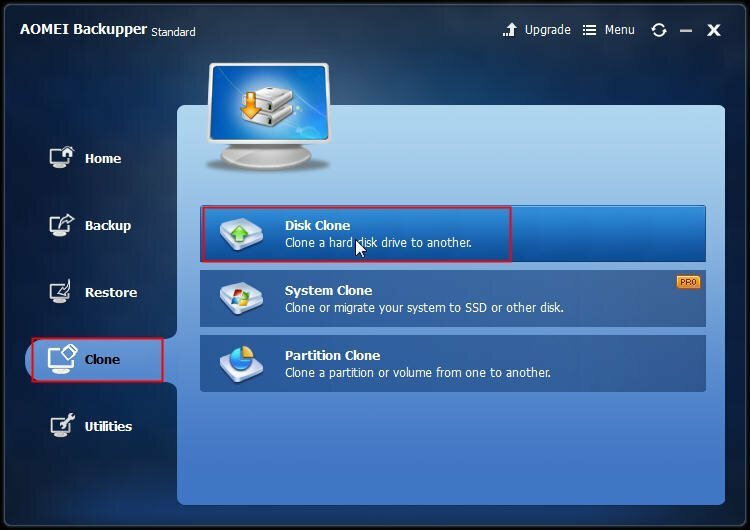 Step1: Select Clone tab in the left and choose Disk Clone. Pay attention to the three functions in the Operation Summary on the left bottom if you need some advanced features to adjust the destination disk partitions. Edit partitions on the destination disk: if you don’t want to make any changes with your destination disk, you can choose Copy without resizing partitions; if the destination disk has unallocated space and you can pick Fit partition to entire disk function and appropriate for the whole disk size; if you want to use Edit partitions on this disk feature, you need to upgrade to the professional edition to try it. Sector by sector clone: if your destination disk is smaller than your source disk, you’d better not tick this option since it will clone all sectors to destination disk. It usually takes a longer time. Align partition to optimize for SSD: from the words’ meaning, if the destination disk you choose is SSD, ticking this function can accelerate the writing and reading speed for SSD. Step5: Finally, it will be executed immediately and finished soon. Just click Finish when the disk clone progress completes. Bear it in mind that all data in the destination disk will be overwritten if you use the clone function. You must backup the important data before cloning execution. 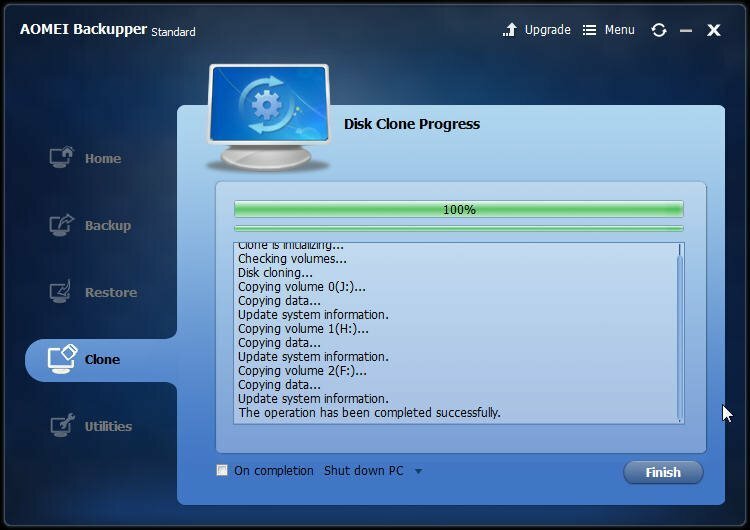 As the best free Acronis data migration alternative for windows users, AOMEI Backupper Standard is not only a disk cloning tool, but also an outstanding windows imaging utility. You can create disk backup image so that you can restore all the data from the image file if need in the future.